By Dahyana Arias Escayola: Two members of MB&B participated in a panel hosted by Yale Law School on the Science of Science Communication. Carl Zimmer and Sarah Smaga discussed the importance of science communication and their role in communicating science as a science journalist and graduate student, respectively. 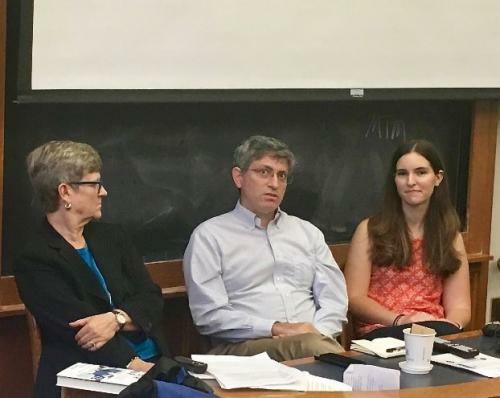 Carl and Sarah joined Dr. Kathleen Hall Jamieson, Director of the Annenberg Public Policy Center, in answering questions from a mixed crowd of scientists, law students, and other members of the Yale community. The panel was moderated by Dan Kahan, the Elizabeth K. Dollard Professor of Law and Professor of Psychology. Not only were two of the three panelists members of MB&B, but a great portion of the crowd included MB&B students who joined in the discussion.